As an entrepreneur at this stage of the game, you’re starting to see a pivotal role an Electronic Point of Sale (EPOS) system plays in your small business. You’ve finally reached the tipping point. All the tell-tale signs are there – signs you’ve outgrown your EPOS. Business is booming, and all those funny little quirks and workarounds for day-to-day operational procedures aren’t so funny anymore. What worked when you first opened your doors can’t keep up with the current demands of your business, and you’re contemplating a fresh start. However, it’s not uncommon for business owners to put off updating their EPOS systems because of the perceived hassle of the whole process. And this perception often overshadows the actual benefits of an electronic point of sale upgrade. If this sounds like you, you’re not alone. This is numero uno and one that’s most likely been slipping for some time. Is business increasing but from an operational standpoint you continue to fall further and further behind? Take a long, hard look at your business processes and identify areas where you can increase efficiency. Is the checkout process taking longer than it should? Are customers able to pay with their preferred payment methods like credit cards, debit cards and Apple Pay? How many hours does it take to conduct an inventory audit? Is your current system always on the fritz or do you have to perform some funny ritual to get it to work right? When your operational performance suffers, you’ll also see a downward trend in customer satisfaction. 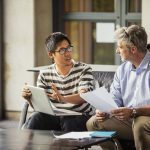 That’s when all of these seemingly small things can have a significant effect on the performance of company operations and ultimately your bottom line. Speaking of bottom line, inventory management is a huge influence on your bottom dollar. Too much inventory can shrink your cash flow and not enough inventory can hurt your potential sales revenue. It’s a fine line all retailers walk. It’s an even finer line for restaurant owners because their inventory is perishable. At least retailers can sell end-of-season fashion on the discount rack to try and profit from unsold inventory; restaurateurs can’t offer expired food at a discount. Do you spend too much time trying to track inventory on spreadsheets and not selling? Are you part of the 46% of SMEs that use a manual tracking method, or gasp, don’t track inventory at all? The ability to organise products by department, category and supplier. Functionality to set reorder triggers along with the recommended ordering amount. Bulk inventory management so you can make product changes en masse. The ability to attach raw goods to items so you can track the components that make up your basic inventory items. The raw goods component of inventory management is a feature that’s mostly used in the restaurant industry to track the ingredients that make up a menu item. For example, if a burger is the menu item, the raw goods would be the lettuce and tomato that comes with every burger sold. This helps to more accurately track food cost and inventory. If your EPOS doesn’t have the right inventory management features, you’re missing out on priceless amounts of data that can help you drive your business to the next level. To truly understand how your business is performing, you need to have a powerful, real-time reporting suite for business intelligence. Sales reports will show you the departments and categories that are making you the most money. What items are your best sellers and what ones sit on the shelf for months? If you’re looking to expand or optimise your business, this information will help provide guidance and focus. Because your electronic point of sale system holds so much data and information on your inventory, your customers, and your financials, it’s essential that is also connects to some of your other business management solutions to help streamline the flow of data, so you can get more done in less time. Considering all the money that exchanges hands at the point of purchase, it only makes sense that your EPOS system should integrate with your accounting software. Small business accounting is a big administrative task that can quickly consume a significant amount of your time. Save hours by automatically sending register sales to your accounting program every night. Is your brick-and-mortar store doing so well that you want to launch a web store? Well, don’t even think about it if your EPOS isn’t integrated with your online store. Unless, of course, you want to live the retail nightmare we discussed in number two. A big part of customer loyalty is an email marketing platform. Email marketing has an average ROI of £38 for every £1 spent. So if you’re not regularly engaging with your customers through email, you’re missing out on some serious money. Customer loyalty programs are quickly becoming table stakes for businesses of any size. After all, it’s six to seven times more expensive to acquire a new customer with onlg 5-20% probability of closing the sale; with existing customers, there’s a 60-70% selling probability. Rewarding customers with discounts or promotional products for their continued loyalty to your brand is a small price to pay to achieve your long-term goals. It’s no secret that gift cards are a great marketing tool for any business. 72% of customers spend more than the value of their gift card and 93% of consumers will buy or receive a gift card. If your business doesn’t support gift cards, you’re missing out on some serious value. Along the lines of gift card payments are other types of payment methods your business needs to accept. While almost all businesses accept cash by default, not all businesses accept electronic or digital transactions and those are quickly becoming the norm. If your EPOS doesn’t support the above payment methods, it’s time to seriously consider an upgrade. Otherwise, you risk alienating shoppers and losing business. Unless you’re a solopreneur, chances are you have a few employees working for you. And if you do, you’ll need an EPOS solution that will give you a way to manage them. If you find yourself collecting pieces of scrap paper from staff with their weekly hours scribbled on it, or tracking payroll by hours scheduled and not hours worked, your current EPOS isn’t doing it’s job. Have you reached the point in your business where you finally have the resources to open a second, third or even 15th location? Are you ready to transcend from a small business and join the ranks of mid-sized companies? If you are, you’ll need an EPOS system that can support multiple stores so you can easily manage all of your locations. The more stores you operate, the likelihood you’ll need to reach out to your EPOS provider’s customers support team is higher. There are more moving parts and people in the mix so the chances of an error occurring increases and you need someone you can depend on to get you through any issues that may arise. Just as you want flexible customer service options, you also want your EPOS system to be flexible and mobile. These days, it’s all about flexibility and mobility. Business owners want options, and they want them to go. With a mobile point of sale, you can sell anywhere from pop up shops to street fairs without compromising functionality. You can also use it in your store as a line-buster to move customers through the checkout process quicker. Lastly, we hope your small business is a labour of love. A passion that has inspired you to get to this point in your career. But what we don’t want is for your small business to take over your personal life and relationships. 46% of small business owners who say that work-life interferes with home life blame administrative tasks as the number one roadblock for achieving work-life balance. As you’ve learned from the previous nine tips, the right EPOS system can help you automate more than just your point of purchase process. It can streamline many of your core business processes and administrative tasks – giving you more time to spend with loved ones. So, there you have it. 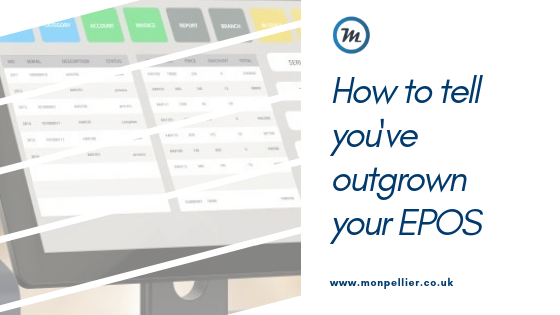 10 signs you’ve outgrown your EPOS system. If any of them strike a chord with you, don’t ignore the warning signs. It’s time to upgrade your point of sale solution to one that will better serve your growing business. If you’re interested in seeing what business solutions there are out there that could help you streamline your business, get in contact with us here, or call us on 0191 500 8150 to speak to a Business Software Consultant.